​In 2008 six countries of the Dinaric Arc Ecoregion (Albania, Bosnia and Herzegovina, Croatia, Montenegro, Serbia and Slovenia) joined forces to protect their rich natural heritage by building an effective network of protected areas. This major commitment originates in the recognition that the natural and cultural wealth of the Dinaric Arc region is a critical asset on which social and economic development can be based, and also in the awareness that protecting this natural and cultural wealth can only be achieved with close cooperation among the Dinaric countries. Hosted by the Slovenian Government, at that time also holding the European Union Presidency, and the Dinaric Arc Initiative partners (WWF, IUCN, UNESCO BRESCE, UNDP, Council of Europe, FAO, UNEP, SNV, and Euronatur), the Big Win for Dinaric Arc high-level event occurred during the 9th Conference of the Parties to the Convention on Biological Diversity (CBD COP 9) in Bonn, Germany, on 29 May. Paolo Lombardi, Director of WWF Mediterranean Programme and the Chairman of the event, welcomed the governmental delegations, donors, representatives of international institutions and other guests by introducing the joint statement and national priorities in delivering on the CBD Programme of Work on Protected Areas (PoWPA). National ministers signed the statement by which they recognized that a joint and coordinated effort is needed in efficient delivery of the CBD Programme of Work on Protected Areas obligations, for safeguarding the Dinaric Arc ecoregion’s exceptional natural and cultural values. The joint statement of the six governments’ representatives is a major highlight of this historic event at which 5 ministers and 1 State Secretary agreed to mutual cooperation, exchange of experiences, and coordinated actions in the sustainable management of the Dinaric Arc ecoregion. Five years after the Big Win for Dinaric Arc document was signed, more than 80% of commitments were delivered. 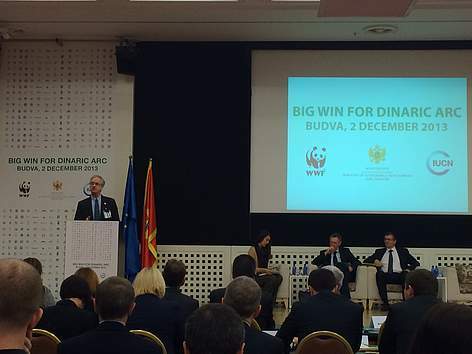 That was the main driver for WWF and IUCN to push for another phase of Big Win for Dinaric Arc. In December 2013 representatives of Albania, Bosnia and Herzegovina, Croatia, Kosovo*, Macedonia, Montenegro, Serbia and Slovenia, endorsed a key agreement for the protection of the environment in the Dinaric Arc region. Key shared objectives for the region were formulated in a joint statement, supported by measureable national priority objectives. European Commissioner for the Environment, Janez Potočnik, offered his full support to the declaration, highlighting at the signing that “It is clear that investing in nature – whether in protected areas or not – is a sound investment and even more so given current economic constraints, when we need more than ever to invest our money wisely. Investing in natural capital, especially in countries such as yours, which have rich biodiversity, will underpin many opportunities for sustainable development in the future”.. Similarly to the 2008 agreement, this agreement sets ambitious goals for geographical expansion and improved management efficiency of the protected area and Natura 2000 networks. The agreement calls for increased focus on improving biodiversity data, better stakeholder engagement at a local level and continued efforts in strengthening transboundary collaboration. What is new is that this agreement specifies the urgent need to recognize, demonstrate and integrate the value of natural capital into policy making. Recognizing the contribution of protected areas to national economies, and the integration of nature conservation goals into sectoral developmental plans and cross sectoral cooperation, are both explicitly cited as joint priorities for the entire region.